Random Anny .Com: Sorry Mouth! Today's dental appointment was quite the endeavor! I got molar bands on top, two repaired brackets and my bottom braces put in. It took about 1 1/2 hours and pretty much sucked. The spacers were in place so molar bands could be inserted today. Ironically my bottom teeth (where I had wisdom teeth removed in January) were still so tight the bands couldn't be placed. The dentist opted for metal brackets instead. I prefer metal brackets to the bands because I can't stop playing with my top bands. They have distracting "things" sticking out of the back! The repairs were easy and my wire was replaced. I brought in floss and Sonicare so I could do a thorough floss/brush before the wire was replaced. The teeth were only unwired for about ten minutes but the difference was immediate. My teeth felt...looser? Its kind of like taking off pants that are too tight but not uncomfortable. The relief is surprising because you didn't realize there was discomfort beforehand. As this is my first time bracing the bottom teeth there is a lot of pressure. When I got my top braces put in November I was in "pressured pain" for about three-four days so I'm expecting the same with these. Oh! My top braces and bottom braces go back further than before. Before they only left the back two molars unbraced. Now they only leave the very back tooth loose. Every other tooth is now wired together. I had pasta a little while ago and eating is going to be a problem. I'm trying to figure out how to avoid hitting the back of my top teeth with my bottom braces when chewing. If my front teeth meet then the back ones "gap." With pasta I was able to almost grind the food but don't fancy doing that for a whole year! 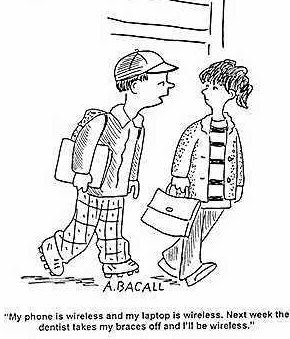 HI-larious, love your cartoons! you are funny and optimistic, great to read. 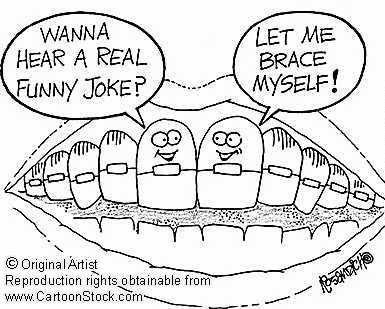 i just got braces too - what an ordeal. did you get samples of that platypus flosser from your ortho? i just did at my recheck, guess they are new and OMG, let me tell ya, major easy to floss now. oh yeah... keep on keepin on. NO WAY! I just googled and that's EXACTLY what I want!!! I used to love my Oral B Advantage Floss and was so bummed that I had to go back to flossing the old way.